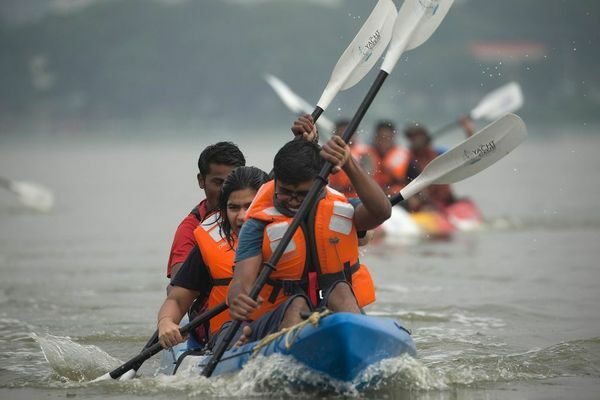 A blast of Flat Water Kayaking that teaches you to steer a Kayak the fun way and also enjoy some competitive racing on a stable three person sit-on-top Kayak. Introduce yourself to an adventure water sport the fun and safe way or just drop in for some great upper body fitness across about 2 plus hours. Great coaching, fabulous environment and loads of fun for all ages. When I pay 550/- what am I paying for ? Can I see what Kayaking looks like ? We take special care of non-swimmers so long as you are not afraid of water and can float in a life jacket comfortably without fear and apprehension. The session is recreational while great for a brisk work out too. The basics of paddling and manoeuvring a Kayak on flat water and some racing too. Are there any concessions for kids ? For kids below 9 you can pay just Rs.350/- on the spot. 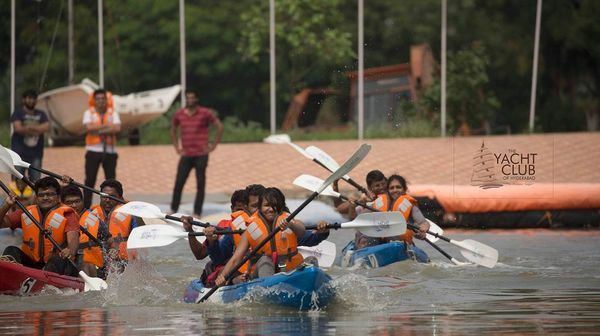 If you pay the booking fees online for a group of 5 in a single transaction (Rs5250/-), the 6th person will get to Kayak for FREE ! Can I get a refund if I withdraw from the event ? The booking fee is non-refundable but transferable. It's your responsibility to get a transfer. How safe is Kayaking and Sailing ? Comfortable clothes that you don't mind getting dirty/wet. Extra set of clothes, sunscreen (if necessary), cap, towel and a reusable carry bag for your wet clothes. A locker facility for valuables is available. Have a light breakfast, and carry drinking water (if you are sensitive to regular water). We serve a light Udipi breakfast at the venue. Can I get some more information about the Yacht Club? Can I see a video clip of the YCH ? Yes, we would encourage you to bring your family and friends along to participate or watch you take part.